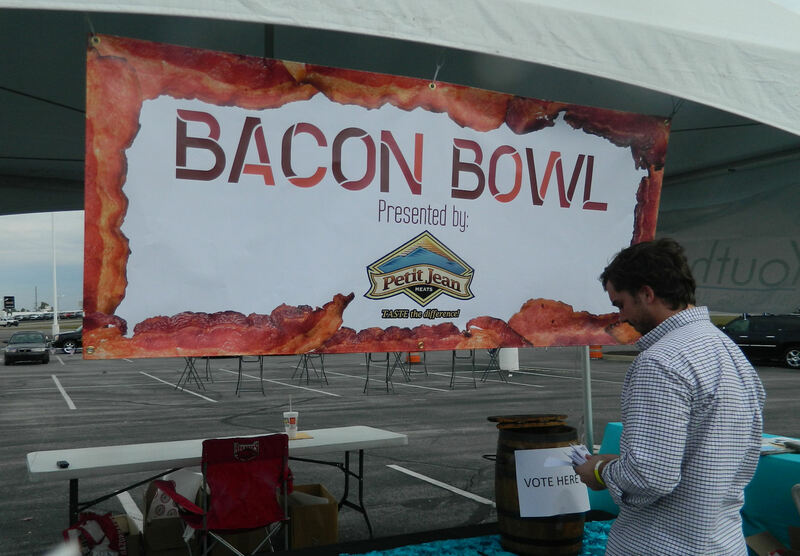 Bacon Bowl 2013: A Competition Featuring BACON! 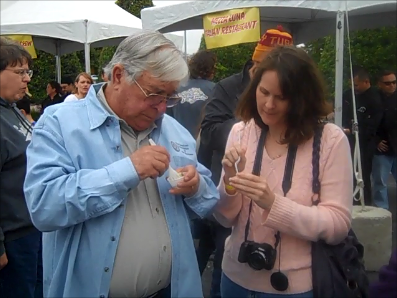 This past Saturday I went to the most glorious, best smelling food competition ever. 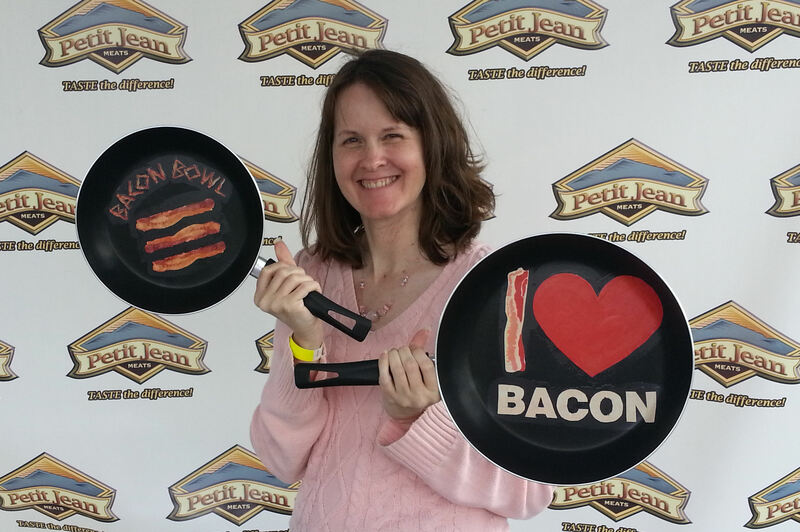 The first annual Bacon Bowl was presented by Petit Jean Meats in Fayetteville, AR. And the star of the show was bacon in all sorts of different forms. 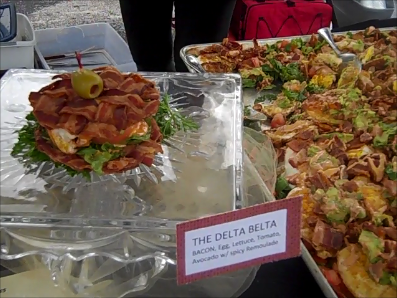 This cooking competition had both entrée and dessert categories – but all dishes had to feature Petit Jean bacon. And I can truthfully say that they were all really, really good! I invited my Dad along because he’s as big a bacon lover as I am, and we had a great time eating our way through the different entries. 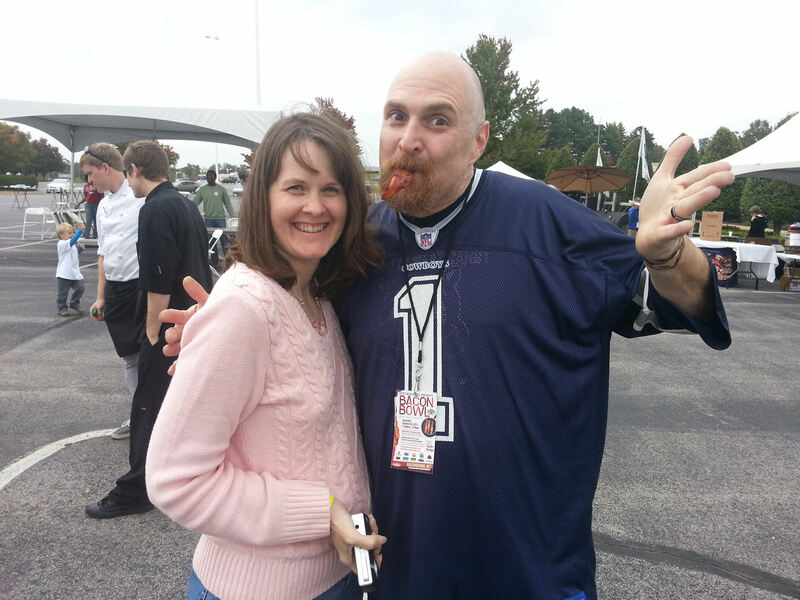 Adam Poch, known as the “Heavy Metal Teddy Bear” on season 13 of Big Brother was one of the food judges – and seemed to be having a good time around all the bacon-lovin’ Arkansans! 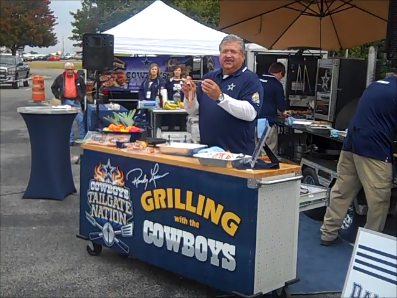 Also, world champion grill master Randy Lann and the Dallas Cowboys Grill Team gave cooking demonstrations throughout the day and doled out samples of such surprisingly tasty morsels as skewers of grilled pineapple and bacon, chocolate covered bacon strips, and bacon-bananas foster. That last one was my favorite of theirs and featured sliced bananas, brown sugar, butter, and maple syrup cooked up in a frying pan plus fried crispy bacon. The whole thing gave a wonderful spicy-sweet quality to the bananas. Who knew?? The overall grand champion award went to the bacon wrapped meatloaf, which is shown in the video and was really, really good. It was my Dad’s favorite and featured truffle and parmesan whipped mashed potatoes and bacon-infused gravy. Yum! These winners will now get a chance to represent Northwest Arkansas in a March 2014 competition in New Orleans. 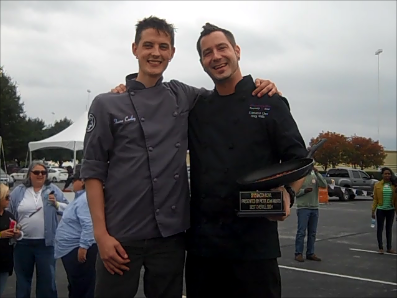 By the way, the bacon-wrapped chicken and white truffle sauce I mentioned in the video did well too, receiving the People’s Choice Entrée award. If you missed this event, be sure to come out next year for Bacon Bowl 2014. We’ll definitely be there again. And my Dad says he’ll be entering the bacon eating contest. Or cooking. Or just going around sampling again. No matter what, it’ll be another good time! Who would have ever thought that a “Bacon Bowl” would be so fun and so surprising with all the different foods with a bacon theme that actually tasted so good! Since this was the first year it was held, I’m guessing next year will be even more popular. Now that the word is out, a lot more people are looking forward to attending next year. Good job covering it. Thanks! It really was fun – and surprising. I never dreamed the bacon dessert would be so good. I really am going to try to make that sweet bacon and bananas dish. Mmmmm! This event would be hard to even drive past without stopping. I bet it smelled great. The pictures and movie have me wanting a BLT (hold the tomato). It did smell soooo good there. 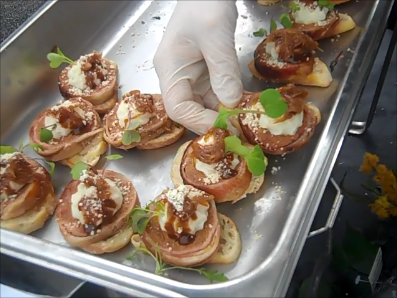 And send photos if you end up trying your hand at making a BLT (bacon-little-tart, like in the video)! Mmmm, bacon wrapped meatloaf. Just bacon in general! This looks like a heavenly event. Thanks so much for sharing on Inspire Me Wednesday! You’re welcome! And thanks for stopping by. You always find the most fun and entertaining things to do and to participate in right here close to where you live. Thanks for letting us share them with you.